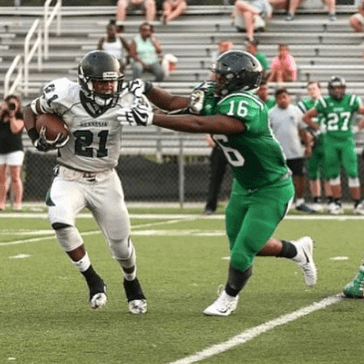 Kennesaw Mountain RB Keyon Brooks had 493 total yards – rushing for 331 yards and caught three passes for 162 yards. He scored five touchdowns in a 45-28 victory over Lassiter. His touchdowns covered 51, 74, 47, 80 and 70 yards. Brooks, who is committed to Arkansas State, surpassed 1,000 yards rushing for the season (1,109).